In English-speaking countries, dulcimer (or dowcemere, dulcimor, dulcimur, doucemelle, doulcemelle, dolcimela, or dolcema, all from dulce melos, Greek for sweet sound) was the name given to the type of psaltery or box zither which had a trapizoidal soundbox and which was played by striking the strings with hammers. In areas around Germany, the term was Hackbrett (or hackbrad, hackbrade, hakkebrett, or hakkebord) meaning chopping board or chopping block. 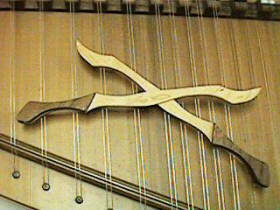 The King James translation of the Bible occasionally translates nebel as dulcimer, but the ancient Hebrews didn't have a dulcimer as we know it from the Middle Ages. A 12th century ivory book-cover made in Byzantium contains oldest known evidence of the typical trapiziform instrument with lateral strings. Then no other dulcimer representation is found until the middle of the 1400's, when the instrument was introduced to western Europe. Shortly thereafter, dulcimers were found in Germany, Italy, Poland, Hungary, Bohemia, Flanders, northern France and England. Dulcimers often had one or two bridges over which the strings crossed providing the opportunity for more pitches because the performer could strike a sound on each side of the bridge. 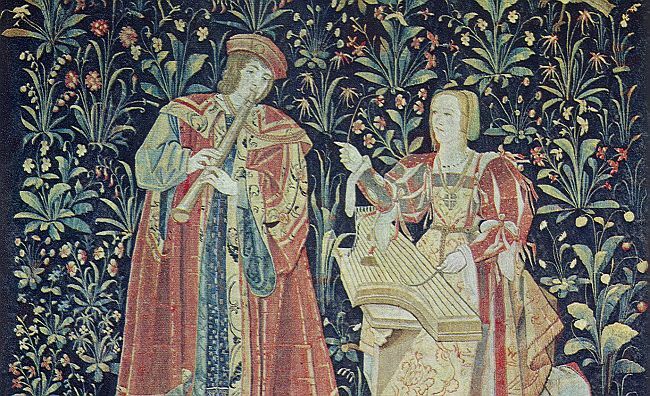 In 15th century images, dulcimers had single courses of six to nine strings and were played on the lap or on a table. The hammers seem to be held between the index and middle fingers. A century later, the multiple bridges were more common, with between eight and twelve double courses. A neck strap could be used for portability. Soundboards were commonly decorated. While images portray the dulcimer held by angels and individuals of the upper classes, Gehard de Jode portrayed it in 1600 along with the hurdy-gurdy and bagpipe. 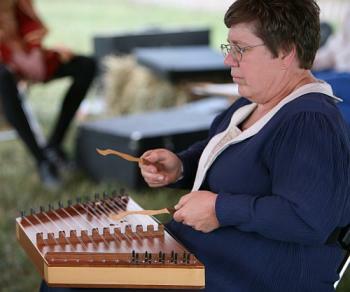 In 1609 a dulcimer was recorded along with a violin in a ship's log in Jamestown, Virginia. Musica Antiqua's collection includes a hammered dulcimer.